Following the successful launch of Friends Fun Wine’s new flavors in graffiti-inspired bottle designs, the Fun Wine Collection – including Coconut Chardonnay, Strawberry Rose Moscato, and Sangria – has received silver and bronze medals, along with notable praise in the Flavored Wine & Wine Cocktails category, as part of the World Wine Championships by Tastings.com, powered by the Beverage Testing Institute. The World Wine Championships is America’s oldest annual international wine competition. The wines in each category are judged by Tastings.com’s trained staff joined by top wine professionals and buyers from retailers and restaurants using a consistent, proprietary methodology developed in collaboration with Cornell University. Review: Bright silvery straw color. Sweet, tropical aromas of coco lopez, pineapple cake, limoncello, and ripe papaya with a round, bright, sweet light-to-medium body and a sleek, medium-length creamy coconut yogurt and applesauce finish. A welcome tropical departure from your average wine. Review: Pale pink coral color. Aromas and flavors of sugared strawberries, strawberry soda, and cherry blossom with a supple, vibrant, spritzy, moderately sweet light body and a buoyant strawberry runts candies and tangerine finish. A boozy soda-like wine for sweet-tooths. Review: Bright light ruby color. Aromas of fresh ginger, sliced apples, pencil shavings, and lipstick with a satiny, vibrant, spritzy, fruity sweet light-to-medium body and a smooth, compelling, easy pencil eraser, sweet blackberry jam, lime spritz, and orange liqueur finish with woody tannins. A solid spritzy red sangria. Today, Fun Wine is available in more than 30 global marketplaces, including the U.S., Europe, Asia Pacific, North and West Africa, and Latin America. Each flavor in The Fun Wine Collection is available in a 750 ml bottle at 5.5% ABV. Friends Fun Wine is leading the global alternative beverage category, producing low-ABV, low-calorie, flavored wine drinks that have captured the taste buds of people around the world. Inspired by the vibrant culture of Miami, the company’s portfolio of bold flavor pairings is perfect for people looking for an alternative to beer and traditional wine formats. 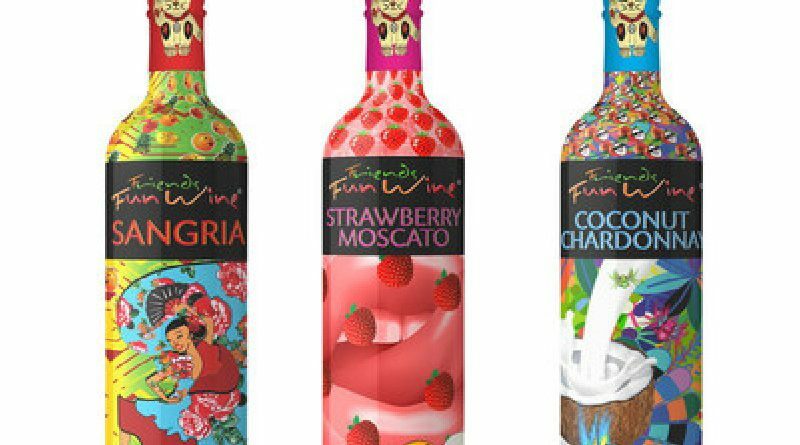 As a lifestyle brand that operates at the intersection of art and fashion, Friends Fun Wine recently introduced a new line of 750 ml glass bottles designed by world-renowned graffiti artist Miguel Paredes for its popular flavor mashups, including Coconut Chardonnay, Strawberry Rose Moscato, and Sangria. The Friends Fun Wine portfolio also includes Strawberry Moscato, Peach Moscato and the world’s first coffee-flavored wines, Espresso Cabernet and Cappuccino Chardonnay, which are available in attractive, slim 250 ml cans. Industry leaders and experts agree that Friends Fun Wine has carved out a unique space in the ever-changing beverage marketplace. Beverage Marketing Group of New York showcased the opportunity for Friends Fun Wine to capture between 2-5% of overall global sales to females and millennials. For more information on the 2017 Study from Beverage Marketing Group, please visit http://funwine.com/friends-sudano-bmc-white-paper/. Copyright © 1999-2019 City Debate Publishing Company, Inc. All rights reserved.